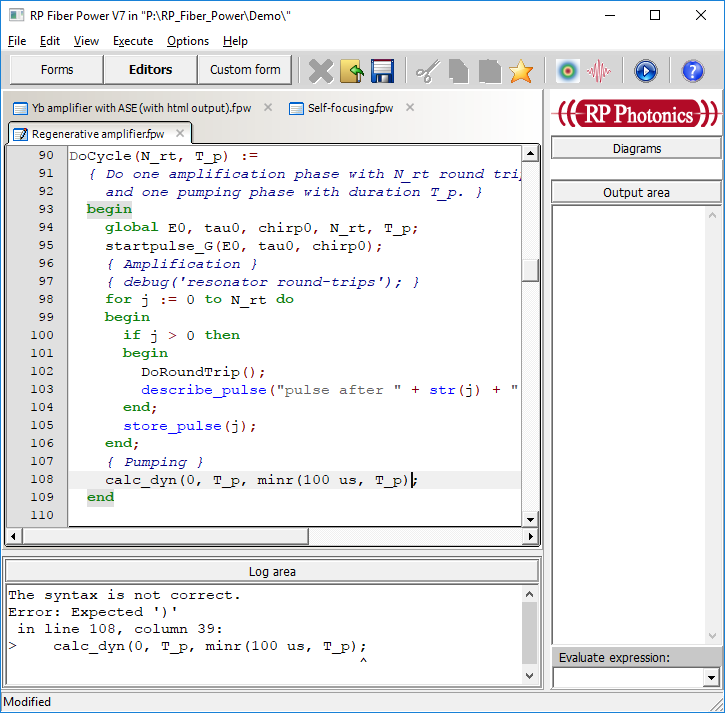 Abstract: The main software products of RP Photonics have been equipped with further substantial new features, including syntax highlighting, parameter help on built-in functions, syntax checking and automatic code reformatting. 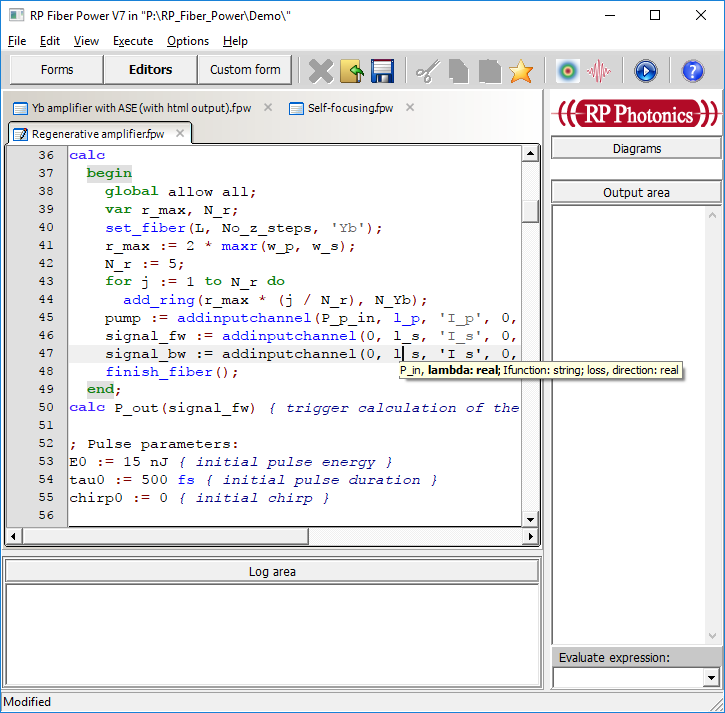 Recently, new versions of our software products (RP Fiber Power V7, RP Resonator V4, RP Coating V4 and RP ProPulse V4) came out, and in a recent post I explained the essential new features, notably the new debugger, improved code formatting rules, a character map tool and some new control structures. Shortly after that, I decided to add further very substantial additional improvements, which resulted in heavy programming work for quite a number of weeks. Now I am happy to describe the results. Before I begin with that, I would like to emphasize that our software does not have to be controlled with script code – it can also be used with simple forms, even tailored forms for certain application (called custom forms); it is only that the full flexibility for most sophisticated simulation is obtained only with scripting. 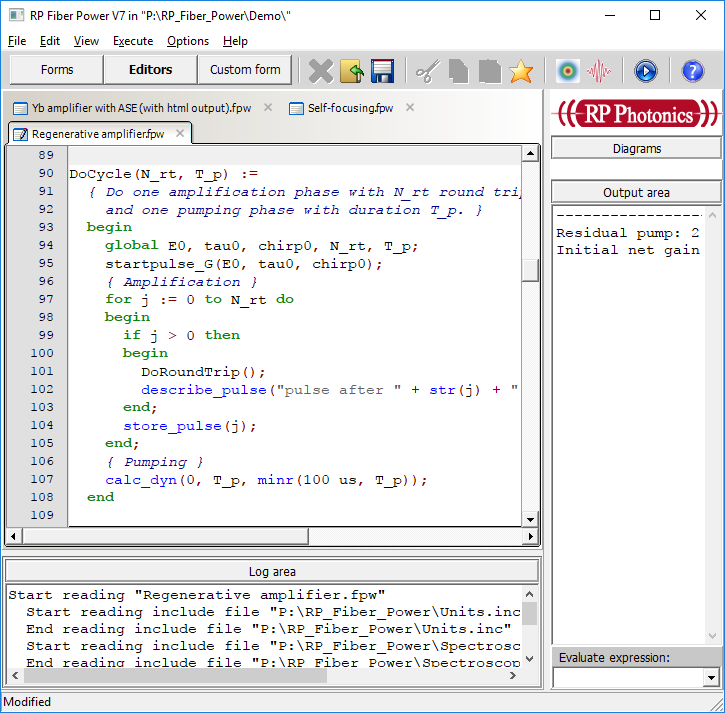 Most of the new features have become possible due to the use of a much improved third-party editor component, replacing the previously used rather basic editor, which was provided by Windows and equipped with some additional functionality (which however is possible only to a limited extent). This is surely very useful, but it also looks nice, doesn't it? If you have once used such a function, the displayed parameter names will easily remind you of what needs to be entered there. In many cases, you won't need to use the interactive help system any more. That's certainly nice, although the interactive help system, showing you many more details, is also rather nice to use: just place the cursor on a function name, for example, and press F2 to search for the function name. Then confirm your choice by double-clicking on the function name in order to get the full explanations displayed. Although simulation scripts usually run rather fast, there are some cases where computation times are substantial – for example, when doing numerical beam propagation on a large numerical grid. In such a case it can be quite awkward if the program executes such a script and then runs into a syntax error caused by a trivial typo, for example. You may then have to execute the whole script once more after correcting the error. Therefore, it can be desirable to check the correctness of the syntax before actually executing a script. As explained in my recent post, I have introduced improved code formatting rules, which make the code substantially more readable. Although that is nice, a rather awkward problem is encountered if you (like myself, for example!) already have many scripts, which you would then like to have reformatted. Well, the software still accepts the old formatting, but it is not nice to have all scripts which do not fit to the improved formatting rules. I myself originally started to manually reformat manuscripts, and I can tell you, that can drive you nuts! That triggered the idea that automatic reformatting would be very nice to have. The caveat is just that it is also rather difficult to implement it. Nevertheless, I finally did this – spending many days with really hard brain work. Now, I'm very delighted to have got it working very nicely. If you wonder how such a feature can be implemented, I give you a few hints. When starting up, the software reads a formal definition of the whole script language in the form of a text. The resulting data in memory can later be used by a script parser. Its original function was syntax checking (see above), but the mentioned formal definition has been amended such that it also describes the preferred kind of formatting – for example, at which positions in the code we like to have a single blank, where do we need to have a line break, or at which locations we will keep a line break only if there was already one in the original code, etc. The mentioned parser can then output the correctly formatted code when reading the original code. It is a highly recursive operation, particularly in the context of mathematical expressions. As you can probably imagine, it takes a lot of thought even just to design the above-mentioned formal description of the script language (particularly if it is so powerful and versatile as ours), let alone to implement the parser which can then operate on script code accordingly. Surely, the new features will be attractive for people considering to start with our software. Existing users will soon get upgrade offers – as always, being very fair; the upgrade prices are only a little higher than the difference of the license prices.